Unopened jigsaw puzzle. Made in the USA. EUROGRAPHICS Allied Air Command - World War II Bombers 1000 Pc. 19 1/4"x 26 5/8"
Puzzle is complete in original box. Box is in excellent used condition, and puzzle is in excellent condition. Puzzle has been put together, photographed, and then carefully dis-assembleD, placed in plastic bag and back into original box. Modern Warplanes 1000-Piece Puzzle By EuroGraphics In Box 19" X 27"
Strong high-quality puzzle pieces. This is new but my son opened the plastic bag that the pieces are in. They are all there. All 1000 of them! Space Shuttle Cockpit 1000 Piece Jigsaw Puzzle Eurographics New Sealed 19" x 26"
Space Shuttle Cockpit 1000 Piece Jigsaw Puzzle Eurographics New Sealed 19" x 26" Please see all quality pictures and ask any questions you may have also check out my many other great offers. Wedding Cakes 1000 Piece Jigsaw Puzzle By Eurographics New & Factory Sealed! Eurographics puzzle of Christmas ornaments and decor 1000 pieces Guaranteed COMPLETE Finished size 19 1/4 in x 26 5/8 in Hours of holiday fun! Box size: 10" x 14" x 2.37". Finished Puzzle Size: 19.25" x 26.5". Every tasty sweet or savory spice in the kitchen can be found in this colorful 1000-piece puzzle. Strong high-quality puzzle pieces. Box size: 10" x 14" x 2.37". Finished Size: 19.25" x 26.5". Aeronautics and space exploration enthusiasts will have great fun putting together This puzzle featuring a detailed cockpit of the Columbia space shuttle. Train Puzzle is NISWB. It is 500 pieces. Tote PUZZ2. 1000 Piece Jigsaw Puzzle Eurographics HDR Photo Neuschwantstein Castle 19" x 26"
New Sealed Puzzle Fun For Any Motorcycle Fan. What You See In Photo's, Is What. All Puzzles Are New And Stated As New. What You See In Photo's, Is What You Get, See Photo's. You Get, See Photo's. From local estate marked all pieces here in box pieces are in a bag taped shut I did not count them. 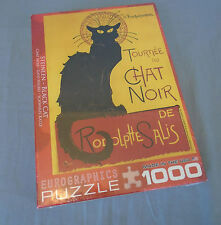 Now being offered for sale is a great eurographics puzzle of 1000 pieces from the company’s sweet puzzle collection. Brand new and still shrink wrapped, this puzzle features my favorite drink —coffee! It measures 19.25” x 26.625” when completed. Please email with questions. Space Shuttle Launching. A dramatic photo of the Space Shuttle clearing the tower. We hope it makes it easier for you to find what you are looking for. do not have to be mutually exclusive. The puzzle is 19 1/4" X 26 5/8" when completed. new/sealed; size 19 1/4 x 26 5/8"
Box size: 10" x 14" x 2.37". Finished Size: 19.25" x 26.5". Mona Lisa, portrait of Lisa Gherardini, wife of Francesco del Giocondo (La Gioconda or La Joconde) is a Renaissance oil portrait painted in the 16th century on a poplar panel. Thanks for considering purchasing! You will receive exactly what you see in the picture! Please check the pictures before buying! Along with all purchases you also receive excellent customer service, and 24 hour or less handling time! Most customers receive their item 3 days after payment is received (occasionally up to 5 days) most of my prices are firm but I will consider offers on a few of the items! Let me know if you have any questions! EDUCA Puzzle By Rodney Lough Jr. Master Wildlife Photographer ~". Art Piece Puzzle By Carl Larsson ~". Creation of Adam " ~ 750 Pieces ~ Preowned. We place clear circle seals on the box edges of these puzzles to prevent any puzzle pieces from falling out. We hope it makes it easier for you to find what you are looking for. NEW History of Trains Puzzle 1000 Peices. Strong high-quality, easy fit puzzle pieces that won't break. Assembling puzzles improves fine motor skills and picture recognition abilities. Welcome! 1000 piece puzzle of SeaWorld by EuroGraphics. Measures 19 1/4 x 26 5/8". The box has been opened but is in excellent condition. Please view all pictures as part of description. If you have any questions, just holler! Your happiness is important to me and I thank you for taking the time to view my items. Cheers! Antique World Map. 1000 pieces. Puzzle is complete, and was solved once. Box size 14" x 10" x 2.5". -condition Excellent. Da Vinci - Mona Lisa Jigsaw Puzzle by Eurographics 1000 pieced Puzzle size: 19 1/4" X 26 5/8" MADE IN THE UNITED STATES OF AMERICA! FACTORY SEALED! BRAND NEW! Evolution of the Aircraft Carrier. to allow for the 1910 launching of an aircraft. The first purpose built aircraft carriers did not appear until the mid 1920's. It was the Crusier USS Birmingham outfitted with planks over her forward deck. LAWREN S HARRIS. 1000 PIECE PUZZLE. LAKE AND MOUNTAINS. HAS BEEN PUT TOGETHER. ALL COMPLETE. Gustav Klimt The Kiss 1000 Piece Jigsaw Puzzle by Eurographics NEW Unopened Box. Condition is New. Shipped with USPS Priority Mail. The many faces of John Lennon. One of the most influential musical artist of the past century, from the Beatles to his solo works. Box size: 10" x 14" x 2.37". Finished Puzzle Size: 19.25" x 26.5". Roses - Seed Catalogue Collection. 1000 pieces. approximate finished size: 19¼" x 26 5/8" (48.89 x 67.63 cm). NEW AND SEALED. FREE Trial !